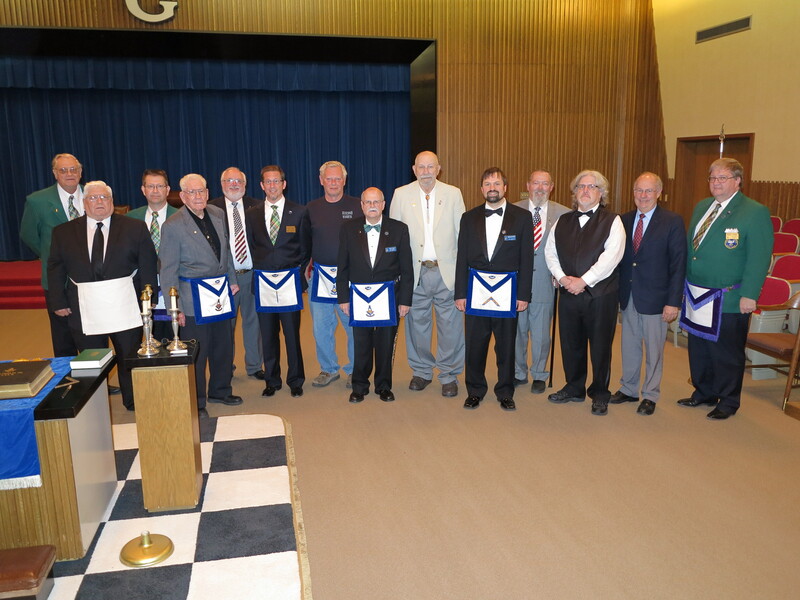 On Thursday, May 28, Unity Lodge celebrated it’s annual Past Master’s Night. Fourteen Past Master’s were in attendance and were greeted with a round of applause and appreciation. Elections were held for the stations of Worshipful Master, Senior Warden, Junior Warden, Secretary, Treasurer, Trustee, and MBA Representative. Worshipful Master-elect Richard Hagler will be installed along with the rest of his officers next month. Unity then opened the lodge to the public and welcomed guests and family of the Brothers. Unity also presented several awards to brothers of the lodge including: Solomon’s Key Award, Working Tools Award, Rough Ashlar Award, and the Mason of the Year. The brothers of Unity Lodge through Worshipful Master Bergstresser also presented a ceremonial apron to Worshipful Brother Kuehn in appreciation of his many years of tireless service to the Lodge.